One muffin tin with 12 holes (each approx. 7 cm in diameter), 6 holes filled with muffin cases or greased and floured. In a bowl, mix the flour with all the other ingredients up to and including the salt. Pour in the almond milk and oil, mix well. Mix in the chocolate and vinegar. Spoon the batter into the prepared muffin tin. Approx. 20 mins. in the centre of an oven preheated to 170°C. Take the cupcakes out of the oven, allow to cool slightly, remove from the tin and leave to cool on a rack. Puree all of the ingredients in a mixer. Chill the mixture briefly. Transfer the frosting to a piping bag with a serrated nozzle (approx. 10 mm in diameter), chill for approx. 15 mins. Pipe the frosting onto the cupcakes. 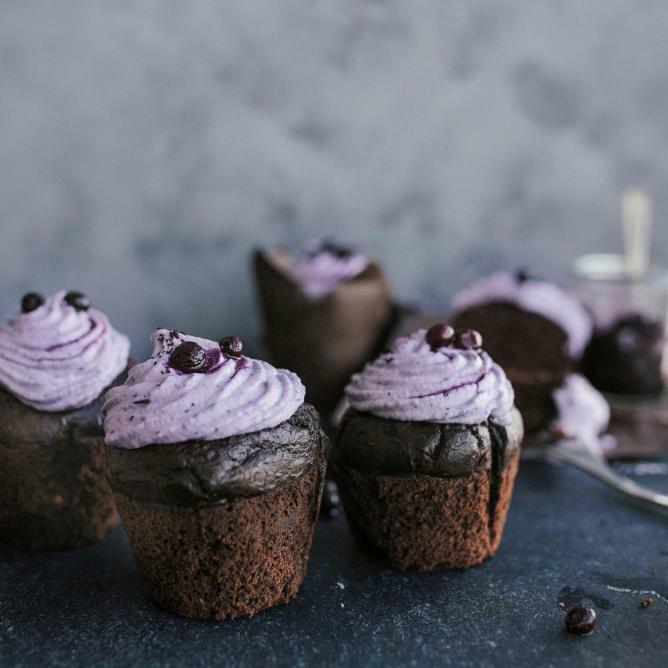 Decorate the cupcakes with blueberries or fruit powder.